Recently you had a meeting in Miami with the former prime minister of Curaçao,Mr. Schotte, in relation to, among others, cooperation between your airline Avianca and the Curaçaon airline InselAír that is almost bankrupt due to very poor management. Mr. Schotte has a long history of fraud, money laundering and corruption to name just a few of the crimes that he committed, for which he was convicted to 3 years in jail last year. I ﬁnd it very strange that you, Mr. Efromovich, a chaìrman of a respected and reputed company as Avianca enters into meetings with the largest criminal in the history of politics of the Kingdom of the Netherlands. Aﬁer your meeting, Mr. Schotte proudly published attached photo of both of you, on whìch you lovingly put your arm around Mr. Schotte, and sent it to the international media. 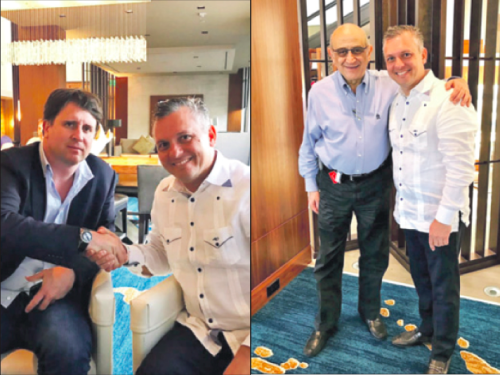 I cannot understand that the chairman of Avianca would be pleased with this kind of international exposure, being intimate with a criminal that is about to be locked in jail for 3 years. I wish to add to the above that Mr. Schotte, because of his long criminal record, is banned from taking positions in the Curaçao government and that he, as an ordinary member of parliament, cannot close any deals with Avianca. I would be pleased to hear your opinìon on the above and look forward to your reply.